Carefully packed into custom-made crates, the exhibition Unveiled: 200 Years of Wedding Fashion from the Victoria and Albert Museum, London, has departed Melbourne for Wellington by sea. In the meantime, its been all go in Te Papa’s Textile Store with the arrival of our New Zealand commissions – or at least two of them. One is still in the throes of being made. While the gown is looking amazing, our designer is looking somewhat worse for wear as she sews into the night, night after night. It has been wonderful seeing the designs metamorphasise from drawings into highly tactile and three dimensional objects. Of course, there have been a few changes along the way – both creative and practical. 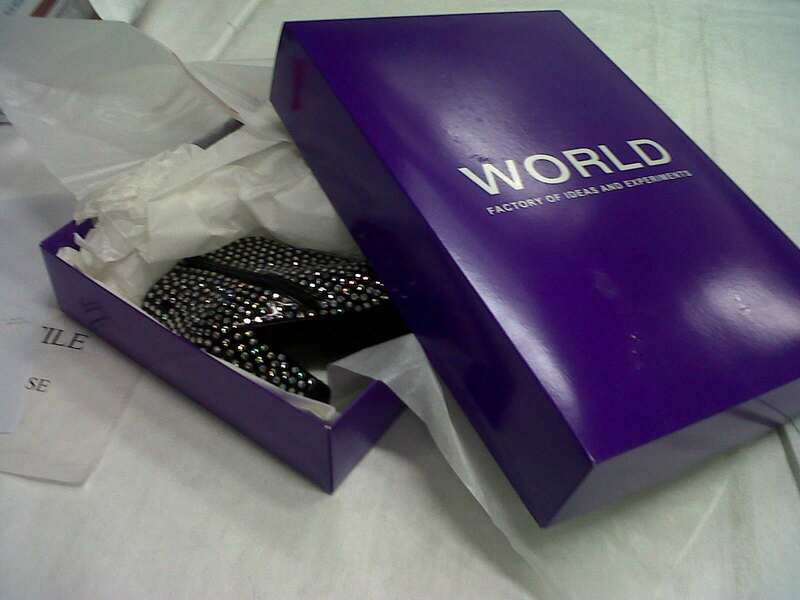 Needless to say there have also been a few surprises, including a bonus pair of shoes and some rather dangerous looking gloves courtesy of WORLD, who have channeled the lively spirit of Surrealist designer, Elsa Schiaparelli. Indeed, in a recent interview Francis Hooper of WORLD stated: ‘Te Papa the client is freaky’ – freaky obviously right down to our fingertips. 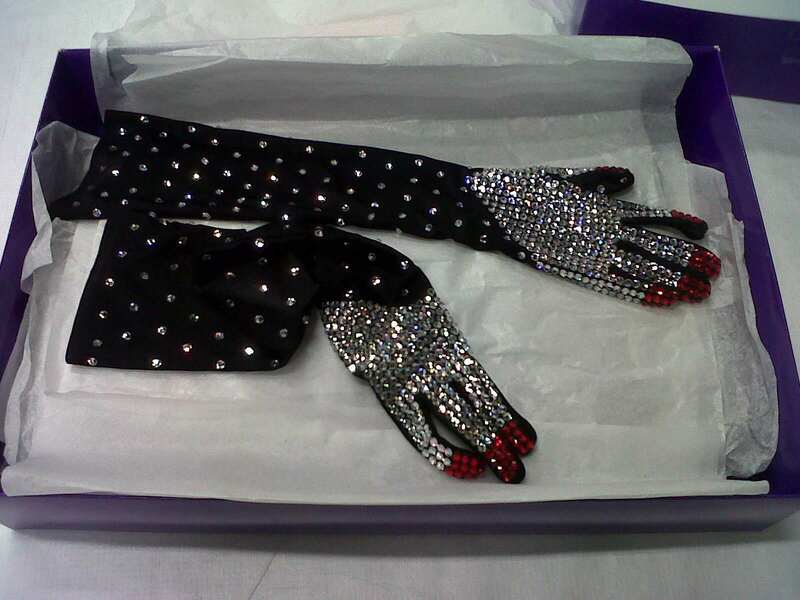 A pair of Surrealist gloves by WORLD for their vampish bride. Collection of Te Papa. WORLD couldn't resist bedazzling the bride's shoes. Collection of Te Papa. 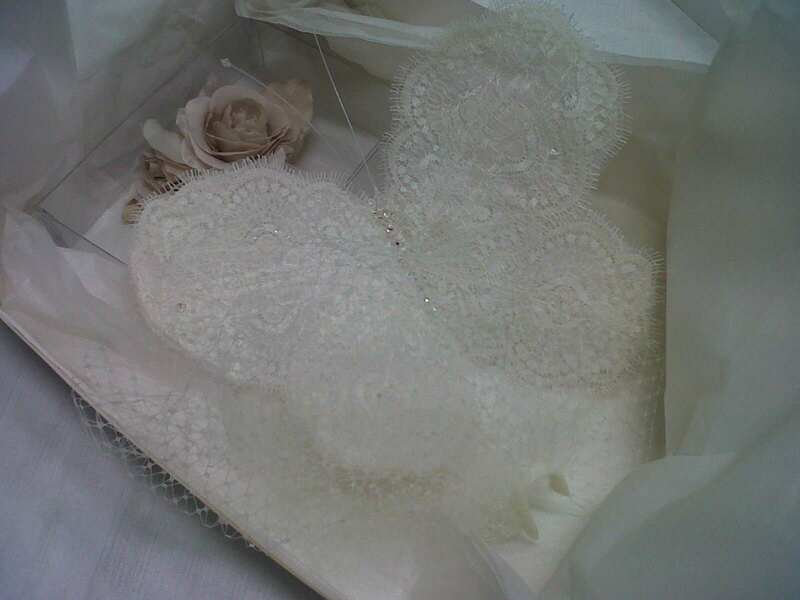 Emphatically declaring that ‘all brides should have crystals on their wedding dresses’, Hooper the WORLD team have painstakingly hand applied, one by one, well over 14,000 Swarovski crystals onto Te Papa’s garments! It is in the unpacking and handling of these garments, that you really begin to appreciate the sheer amount of labour that goes into them. In comparison to WORLD’s freaky bride, well known bridal designer Jane Yeh has created a pure Cinderella moment for Te Papa. Once the dimensions of the skirt came in, we had to double the size of the plinth! Her chantilly lace gown is adorned with hand made flowers and butterflies, one of which gently perches on the bride’s head, completing the delicate veil. 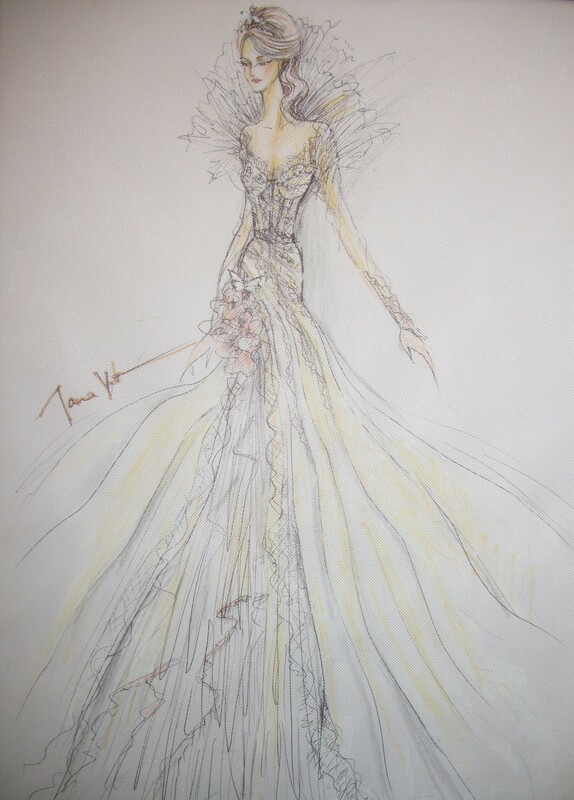 Jane Yeh’s drawing for Floral Goddess. A handmade butterfly and flower completes Jane Yeh's delicate veil to perfection. While WORLD has been busy hand placing crystals, and Jane fashioning butterflies from lace, Lindah Lepou has been immersed in an inspiring but unwieldy tide of tapa cloth. Drawing inspiration from the past, present and future, Lindah has named her gown Siaposu’isu’i after one of her ancestors. Siaposu’isu’i literally translates to ‘sewing tapa’. Sewing tapa has been occupying Lindah’s life day and night! Sourced recently from Tonga, the tapa cloth is relatively fresh, and Lindah likens its delicacy to ‘sewing papyrus paper from Egypt!’, declaring it to be ‘THE MOST intricate and difficult dress’ she has ever made. 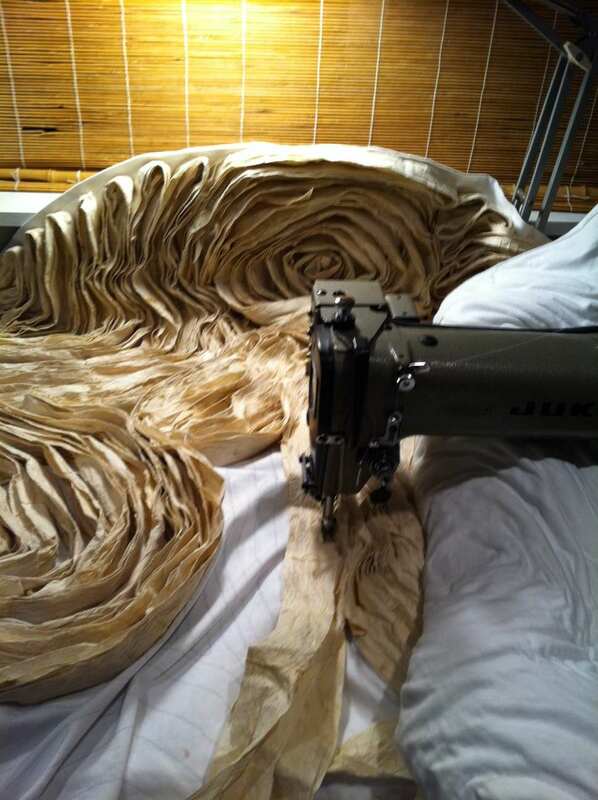 Here is a tantalising image of the gown in process. Lindah Lepou's dress Siaposu'isu'i in the throes of being made. Lindah’s Facebook page has been going wild with excited comments about the almost completed dress. 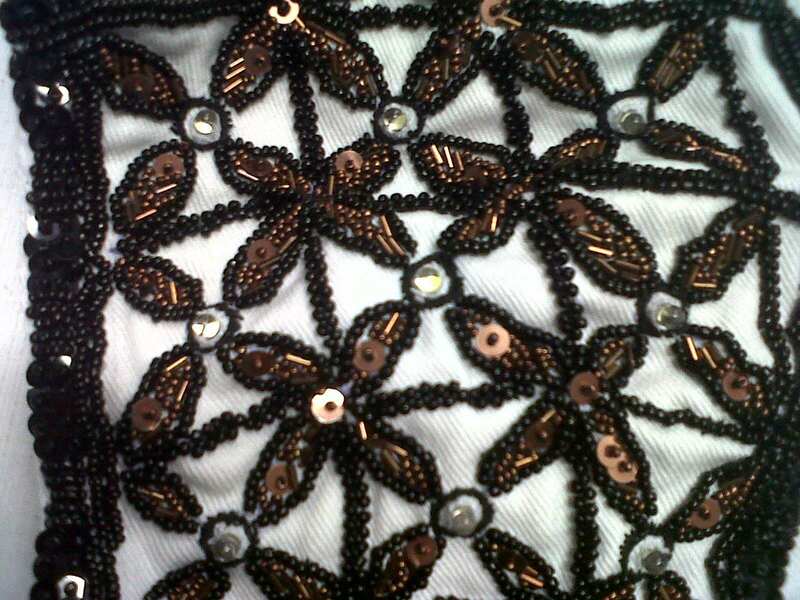 As well as machine sewing, Lindah has also been busy hand-beading. Her intensely coiled and ruffled tapa gown, will be completed by a bridal hood, which has been beaded with a tapa pattern and a special surprise for which you will need to visit the show to see. Detail of the beaded headdress by Lindah Lepou. Collection of Te Papa. During the exhibition there will be plenty of opportunities to meet all three designers, to see more of their work and to get their perspective on wedding design and the spectacular garments shown in Unveiled. Keep an eye out on our Events programme for more details. that, allow me reveal to you pelicsery what did work. Your text can be very persuasive and this is possibly why I am making an effort in order to comment. I do not make it a regular habit of doing that. Secondly, while I can certainly notice a jumps in reason you come up with, I am not sure of just how you seem to connect the ideas which help to make your conclusion. For now I shall subscribe to your issue however trust in the future you actually link the facts much better.